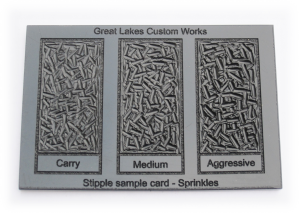 *Stipple sample cards are representations only. 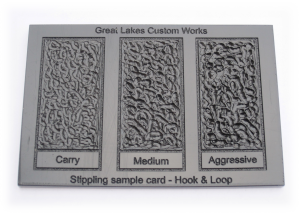 All work is performed by hand, and every polymer is different. Actual results may vary. Customers can ship their items to us however they chose. We will accept all packages. That being said….. Per US Commerce in Firearms and Ammunition (CFA) and the Gun Control Act of 1968, “unauthorized (unlicensed) persons” must ship handguns, and serialized handgun receivers / frames via “common carrier” (UPS / FedEx), and are not mailable via USPS. “Authorized persons” must ship handguns and serialized handgun receivers / frames via “common carrier” UNLESS they are being shipped to active US Military personnel, a law enforcement officer, or an FFL, and fill out PS 1508 form with USPS. In all cases, the sender is required to notify the shipper that the package contains a firearm(s). UPS and FedEx policies both require handguns and serialized handgun receivers / frames to be shipped via “next day / overnight air” services. USPS policies can be found here, UPS’ here, and FedEx’s here. When shipping your items back to you, we are required to follow these guidelines, and as such, so must you when selecting your return shipping options. GLCW also requires any serialized frames / receivers shipped to residential address’ to require adult signature confirmation of delivery. With the affordability of a USPS flat rate small box vs any “overnight” services, and depending on where you live, it may be more affordable to ship that way via a local FFL. If you still have questions on this, please email us. If you think this is stupid, please email your elected officials. Any other items may be shipped however the customer wishes. 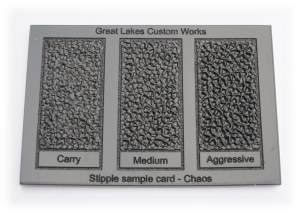 Lead times for custom firearm work is 1-4 weeks not including shipping time. Lead times for slide milling is apx 8-10 weeks not including shipping time. 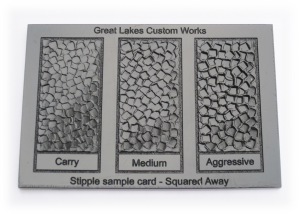 Though minimal, light colored frames such as “FDE”, or “Sand” may be slightly discolored in stippled areas. If an aftermarket magwell is to be installed, please include it with the firearm to be customized. Stippling the area under where a magwell is located can cause fitment issues. To obtain mil, leo, & other first responder discount, customers must email us their credentials. We will then send a discount code to be entered at checkout. Q: How do I know what size my frame is? A: A general guideline for frame size is as follows: Large frames are generally 17+ rnd double stack models like the Glock 17, or S&W M&P full size. Medium frames are generally 10-15 rnd double stack models like the Glock 19, or M&P compact. Subcompact frames are generally <10 rnd, single stack models such as Glock 43, or M&P Shields. If you are still unsure, just ask. Q: I just ordered custom work, what do I need to send? A: For all custom work, the checkout page must be printed and sent with the firearm(s) along with payment if it was not made with CC via the web store. Check ARE preferred to avoid unnecessary CC fees. If only frame work is being performed, then we ONLY need the frame, and any after market parts not purchased from GLCW to be installed on it. You may strip the frame if desired, but it is not necessary. Q: Why am I being asked to pay for shipping when I’m already paying to send my gun to you? A: Because we have to send it back to you. Q: I am going to be adding other aftermarket parts to my gun. Can I just get them from GLCW? A: Yes. We can acquire, and install just about anything you need. Q: Do you sell guns? A: Yes – In our Firearms page here on the website. We can also special order anything you desire. Q: I want (XXXX), but I don’t see it on your page. Can / will you do / acquire that? A: If you don’t see what you’re looking for, ask. You may email, or call us to find out if we offer what you are looking for. Q: Where can I see, and actually FEEL GLCW work? 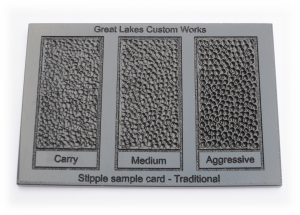 A: Customers may now order sample cards of our stipple patterns available in our custom shop. They can also stop at a number of great stores carrying GLCW display models like ATEi in Taylor, MI, Not Just Guns in Mason, MI, Uncoiled Firearms in Westland, MI, Ann Arbor Arms in Ann Arbor, MI, or Ronin Arms in Cheyanne, WY during business hours to see in stock items. Or, customers can also see GLCW guns and hone their skills as shooters at training courses with one of the great firearms trainers we are proud to call family like MDFI, DMI Performance, or Defensive Training Group. Q: Why is there an additional fee for working on Cerakoted, or other coated frames? A: It is not possible to stipple over Cerakote, or other coatings. These coating must be meticulously sanded off the area to be customized without going outside of those areas at all. This is a very detailed, and time consuming process. Q: I have a gun that I, or someone else ruined by trying frame work ourselves. Can you fix it? “GLOCK”, “Smith & Wesson”, “M&P”, “Cerakote” and “Hanes” are registered trademarks of their respective companies, and is one of many trademarks owned by these companies. Neither GLCW, nor this site is affiliated in any manner with, or otherwise endorsed by, these companies. The use of these trademarked terms on this page is merely to advertise the sale and customization of their products, pistols, parts, or components.